Dualit and Rowlett are two of the best-known names in slot toasters in the UK. Prices are similar, and both offer versions from two slots upwards. Bright finishes are popular, as shown in the illustration. For larger quantities of toast, conveyor toasters are available from a number of manufacturers including Roller Grill, Lincat, Dualit and Rowlett. Such machines can produce up to 1000 slices of toast per hour. Infrared grills which heat from above and below are also popular for dishes such as Welsh rarebit. 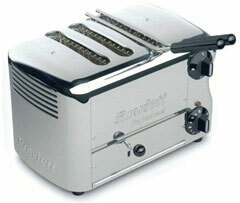 We can supply any make of toaster at good discounted prices.